3 bedroom, 1 full bath cottage in private gated beach community just steps from Long Island Sound. Large sunny three season porch includes dining for 6. Kitchen, living room with television, DVD and stereo, dining area with table that seats 6. Two bedrooms each contain 2 twin beds and third bedroom a queen bed (all bedrooms have air conditioning). Outdoors there is an enclosed shower, cozy back yard with gas grill, lawn furniture and patio with table and 4 chairs. Family orientated community with safe streets for children, security guards, sandy beach with roped off swimming area, large outcropping of rocks that we call "the flat rocks" and we even have Friday night family movies shown on the beach. 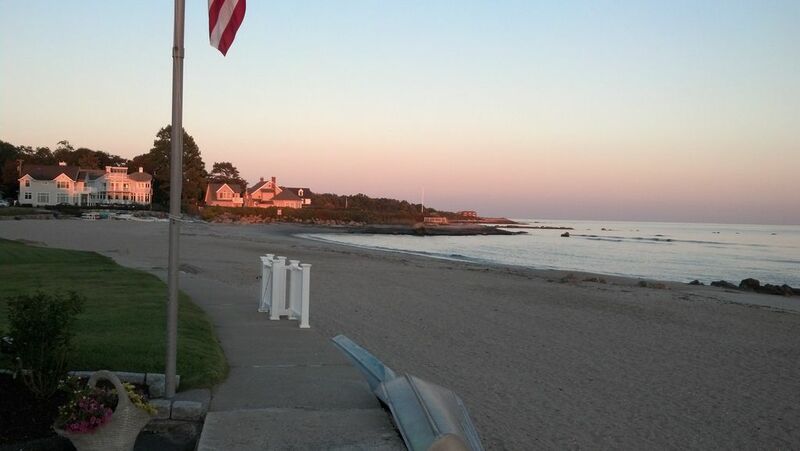 Our family has owned property at Old Lyme Shores since 1929 and 5 generations have loved every minute of it. 500 feet from private sandy beach. Window air conditioners in bedrooms. We had a fabulous week with family, beach, cottage! Beautiful cottage, it had everything we needed, very clean, close 2min walk to beach. Family has vacationed on and off for 68 years, 5 generations loving Old Lyme Shores! Wonderful beach for children. Beach donuts on weekends yummy! Carousel fun for kids just a couple streets over. Perfect get away or fun family beach vacation. Thank you! So glad you had a great week. We agree that Old Lyme Shores is a hidden gem. Cozy and very well located!! My family had a wonderful time and the house was very cozy and also close to the beach!! Immaculate cottage. So relaxing. On same block as beach. We had a wonderful time. The cottage is immaculate, quiet, and so relaxing. We thoroughly enjoyed our stay. We have been vacationing at Old Lyme Shores Beach for 23 years and have stayed at many cottages. This home was great as it had air-conditioning on those very hot July days and the home was clean and bright ! We loved the enclosed outdoor shower but you needed to be careful walking to it as I twisted my ankle on a hole on the pathway. The close proximity to the beach was perfect! We would recommend the cottage to anyone! Historic Old Lyme village, home to artist colony, museums and two Inns. Close to The Kate theater, Fenwick Golf Course and mini golf in Old Saybrook. Goodspeed Opera House, in Chester, Ivoryton Playhouse in Ivoryton, Mystic Seaport and Aquarium, Mohegan and Foxwoods Casinos, CT river, Essex Steam Train, Groton Sub Base, CT Wine Trail wineries, Clinton Crossing and Tangier Outlet Malls, kayak and canoe rentals, Rocky Neck State Park. One or two week rentals only.